Allie France (9th blade from left) representing the ACRA All-South team! Our Women's Varsity 4 races at 11:32 a.m. on Saturday. There are 17 entries in that category. Our heat will include crews from St. Mary's, Purdue, New Hampshire, Ohio State, and Texas. The top 2 will proceed to the finals. The remainder will enter the "repechage" round. I'm told "repechage" is French for 2nd chance. The winner of the repechage heats will proceed to the finals. The remaining crews will be in the "B" finals. Our Men's Varsity 4 races at 12:10 p.m. There are 33 entries in that category. Our heat will include crews from Boston College, Michigan State University (the other MSU), UMass, Purdue, St. Mary's, and University of Southern California. Again, the top 2 will proceed to the finals, then the repechage heats, and the "B" finals. Vegas has the best odds on our Women's Novice 8. I'm putting my money on them, but I'm expecting something special from the WV4 and MV4. 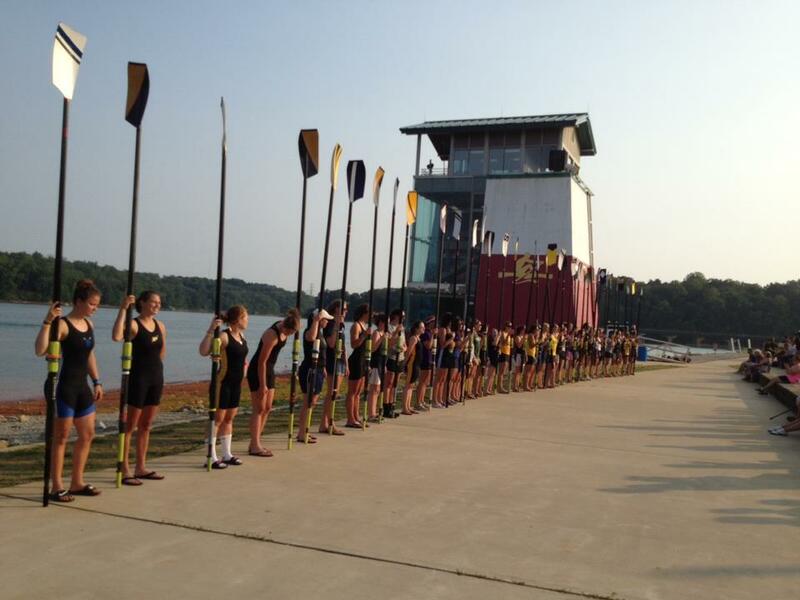 Keep up those positive thoughts for Racer Rowing in the National Championships!